So you’re best friend’s getting a little older and a little wiser. They have stories to share and whiskers of gray hair. They might not move as fast as they used to but, in those eyes – you still see that puppy of yours. And it breaks your heart when you see them struggling to walk to their food dish. It makes your eyes water when you see them stare longingly as their favorite tennis ball rolls away, without the swiftness to chase it. You don’t want to give them a ton of medication that could result in side effects or even worse problems. But you can’t bare to watch them live like this. There has to be something you can do for them. And there is. There’s another option: DGP. 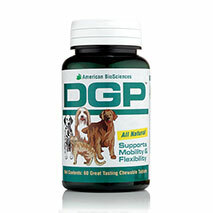 DGP was made by a team of veterinarians and herbalists to ease joint discomfort and to let that inner puppy show up again. It’s a combination of herbs, extracts, enzymes, spices, and roots – it’s all natural and non-toxic, there is no prescription medicine in this supplement. It helps the circulatory system function better, boosts the digestive system, soothes joint discomfort, and promotes healthy joints. And the best part is it works almost immediately. Some other solutions like glucosamine and chondroitin can take months to start working. Months. Months watching your pet’s discomfort. Don’t make your pet wait. Every moment is an opportunity for them to stretch out those joints and get one more run in. Every moment is an opportunity for your pet to get a little more exercise, which can add to their quality of life. In addition to the direct effect of turning your pet’s joint discomfort into joint mobility and flexibility, there are some other benefits that come along with it. It will increase their energy and improve overall health and happiness. You’ll see them come alive again. You’ll see that smile come back into those wise eyes, bigger than ever. You’ll see a pep in their step as they trots from tennis ball to food dish. They won’t be moving like a puppy but they’ll be happier. There’s one more benefit – the positive effect DGP will have on you. You’ll no longer have to spend so much time in worry and sadness about your best friend. You’ll no longer have to spend extra time caring for him as they’ll be able to care for theirself again. And when your pet’s happy, you’ll be happy too. No one wants to see a friend uncomfortable, especially one you’ve been through so much with. Revitalize him. Give them the gift of being them without being held back by joint discomfort. And do it in a natural way. Do it with DGP. You won’t regret the extra memories you’ll be able to create with them.